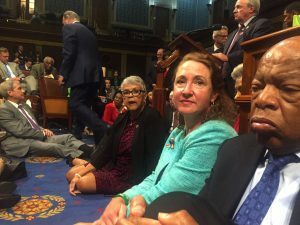 WASHINGTON — A drained and dwindling group of Democrats, some draped in blankets and toting pillows, carried their remarkable House floor sit-in past daybreak Thursday, disrupting the business of Congress in the wake of the Orlando shooting rampage with demands for gun-control votes in an extraordinary scene of protest broadcast live to the world. “Just because they cut and run in the dark of night, just because they have left doesn’t mean we are taking no for an answer,” said Pelosi, D-Calif.
Rep. John Lewis, D-Ga., who had participated in the civil rights sit-ins in the South in the 1960s, said Democrats had “crossed one bridge.” He added, “We have other bridges to cross.” He said Democrats “made a down payment on ending gun violence” in America. Ryan, R-Wisc., said the bills pushed by Democrats, to expand background checks and keep people on the no-fly list from getting guns, would take away people’s constitutional rights and deprive them of due process, and he noted similar legislation was already rejected in the Senate earlier in the week. By evening, 168 House Democrats — out of 188 — and 34 Senate Democrats joined the protest, according to the House minority leader’s office. One after another, they spoke of the need for gun control and talked of constituents who had been killed. Scattered around the House floor were signs reading “Disarm Hate.” Visitors watched from the galleries. A crowd of several hundred gun control advocates gathered outside the Capitol and cheered as Democrats addressed them. C-SPAN, a cable and satellite network that provides continual coverage of House and Senate floor proceedings, does not control the cameras. They’re run on authorization by legislative leaders. Although the cameras were turned off Wednesday, lawmakers relied on social media to transmit video, using Facebook, Twitter and Periscope. C-SPAN broadcast live video streamed on Periscope and Facebook from lawmakers’ accounts. Democrats posted the Capitol’s main telephone number, which was overwhelmed, and urged constituents to call and request a vote. They also encouraged tweeting under the hashtag #NoBillNoBreak. Associated Press writers Matthew Daly, Mary Clare Jalonick, Andrew Taylor, Darlene Superville and Alan Fram contributed to this report.